In this post we are going to see c prime number program. in which we will see how to check where given number is prime number or not a prime number through a very simple logic in c prime number program. "prime number is nothing but the number which can be divisible by only '1' and 'itself number' only." means a number which cant be decide by any other number other than 1 and itself number. for example: suppose 5 is a number. 5 can be only divisible by 1 and 5, so that it is prime number. take another number 6, 6 can be divisible by 1,2,3 and 6, so that it is not a prime number. hope you understand logic of prime number. lets see how to write c prime number program. 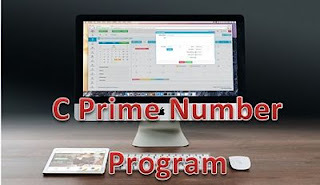 hope you have understand the prime number program in c. if you have still any concern about it you can fill free to ask in comment box.